While browsing on Fickr, I came across Smiley518's set on the 2008 Indian Summer Festival held in Milwaukee, Wisconsin. 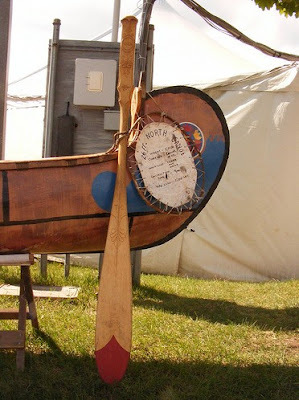 She took some fantastic pics of the event, including some shots of Voyageur Canoes, an Eastern-style Ojibway Birchbark Canoe, and a unique paddle design that caught my eye. Unfortunately, the name of the artist isn't known but it's a beautiful piece of work. 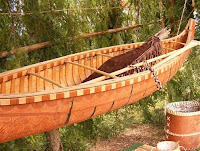 I'm no expert, but it reminds me of a slender Maliseet-style beavertail with an nicely carved grip. At my request, Smiley518 graciously provided a zoomed image of the grip with its beautiful decorations and permission to post it. Along with the floral motif, there's a central medallion carving with what looks to be a beaver. 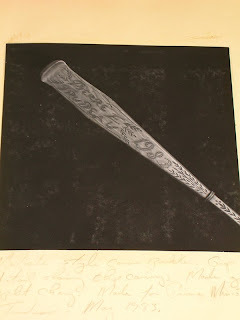 Although decorative wood carving isn't my forté, I'm going to try and relief carve something like this with a future paddle blank I have on hand. 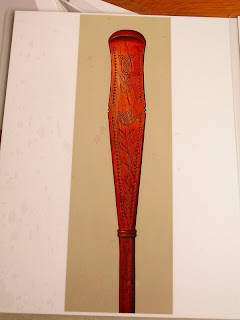 Back when I met Rick Nash at the 2008 WCHA Assembly, I took a photo of one of his chip carved grips, including one made for our canoe loving Prime Minister, Pierre Trudeau. I'll probably have to practice on many wood scraps before I attempt to do anything like these carved grips on a fully completed paddle. Perhaps the carving can be combine with pyrography to get a sort of 3-dimension woodburning effect. So many ideas - not enough TIME!